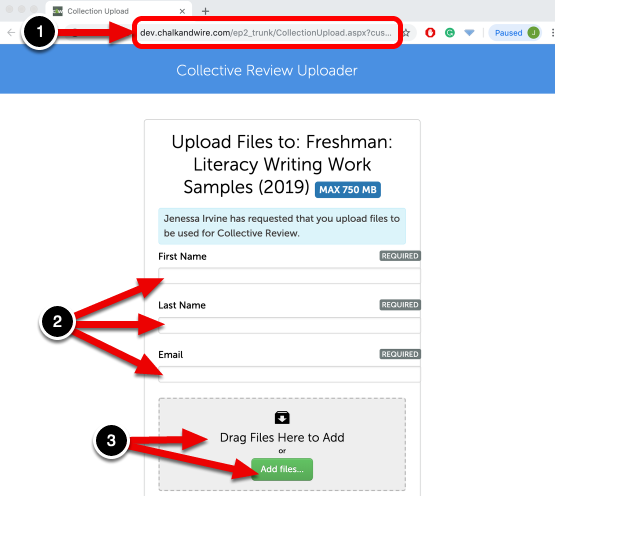 This help page will walk you through how to upload files to a Collective Review Collection via a secure URL provided to you by a Chalk & Wire administrator. 1. Enter the secure URL for which you were provided into the browser address bar at the top of your Internet browser window, then click Enter on your keyboard to access the website. 2. Enter your First Name, Last Name, and Email Address into the fields provided. 3. Click Add Files, or drag and drop the files into the uploading area. 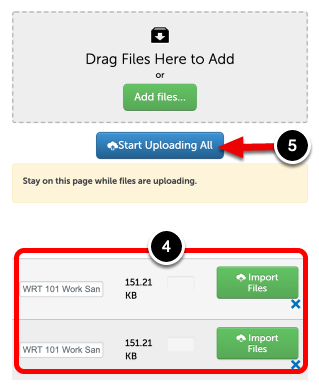 You can upload individual files or .zip files containing multiple individual files (.zip files will automatically be unzipped during the upload process). There are no required naming conventions for files uploaded to Collections. However, using consistent naming conventions across your uploaded files will allow your institution to more easily locate desired files when generating assessments. 4. The files will appear at the bottom of the uploading area. 5. Click Start Uplaoding All to begin uploading your files. 6. 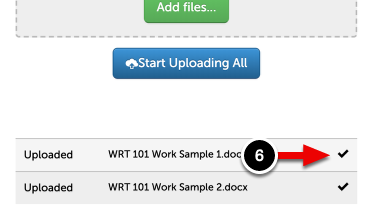 Once the file(s) have finished uploading you will see a checkmark to the right of their name. You can then continue uploading additional files (if needed) or close the browser window if you are finished.